Elizabeth Benotti’s work explores the relationships between everyday objects, color, image and form. Using porcelain, she interchanges slipcasting, handbuilding and wheelthrowing techniques. The objects act as a canvas for drawings that can be found on most of her work. The drawings are all inlaid into the clay using a traditional mishima process and the decorative colors are hand painted. 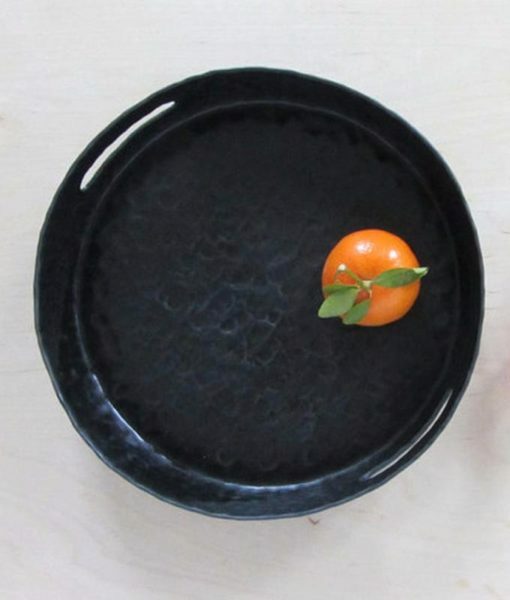 A serving tray with cut out handles pinched from porcelain clay and glazed in a satin black. This lovely piece is suitable to leave out on display on a coffee table or on the counter. This could also house toiletries in your bathroom.